Enjoy the experience of a lifetime, and come sailing on this historic yacht! Enjoy the experience of a lifetime, and come sailing on this historic yacht! Sailing on a 12-Metre yacht will give you an exhilarating day out, and one which most sailors would be thrilled to be offered. Our fully qualified skipper and crew will encourage you to take as much part in the sailing as you wish, but less experienced guests will soon feel confident enough to get involved. Sceptre is available for weekend charter (or longer by arrangement) for up to nine guests. In 2019 this will be on the Solent or the South West coast of England, where there are many excellent destinations. 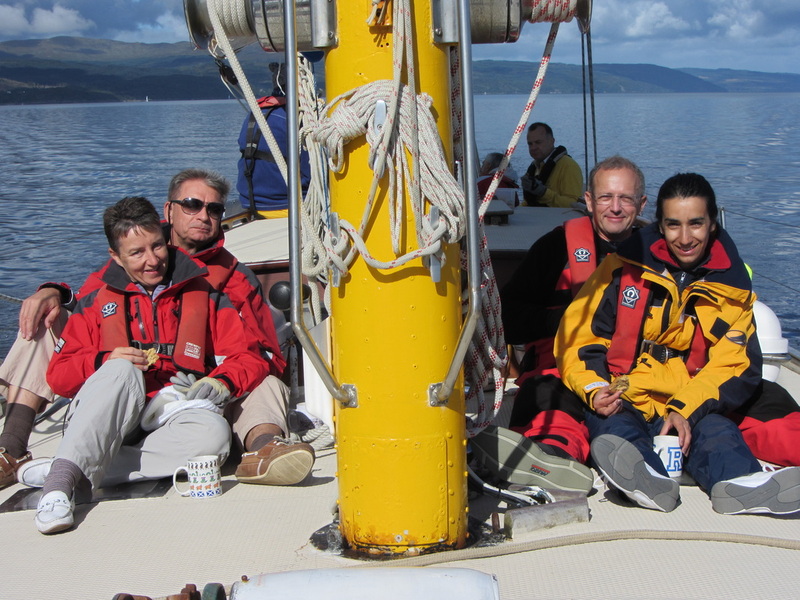 Traditional single-berth accommodation is provided on board – a great opportunity for a team-building weekend or a sailing enthusiasts’ get-together. ​Download our Brochure booklet here. When Sceptre was converted from her original open cockpit racing configuration to a cruising yacht, it was always envisaged that she would be offered for charter. Why should I choose Sceptre for my event? 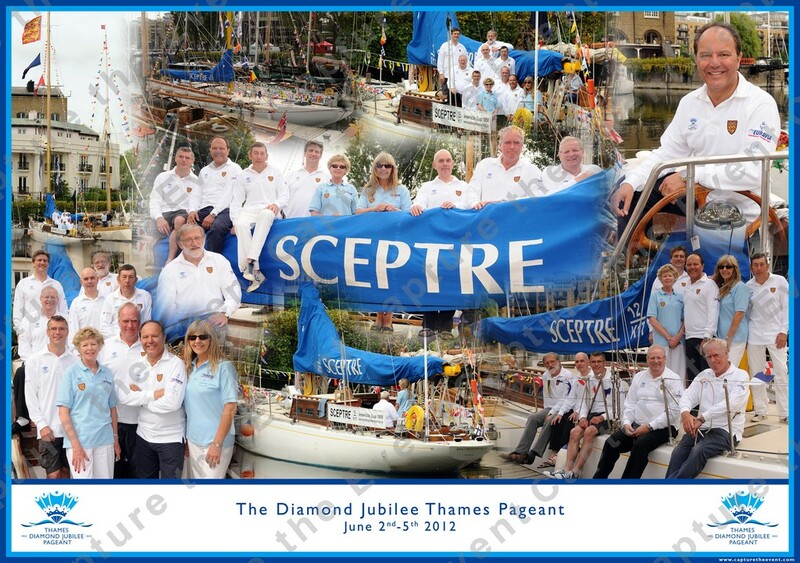 Sailing on Sceptre is a very special experience. With a mainsail of 1250sqft on a 25m mast she is always keen to move along, and in a good breeze she gives an amazing sense of power. Thanks to her long keel and 3m draft she is a delight to handle, and when coming alongside, her experienced skippers can squeeze her into surprisingly small spaces! Those new to sailing will have a thrilling and rewarding experience, and those more familiar with yachting will feel privileged to have spent some time sailing this historic yacht. Click on the video link below to see exactly why you should consider Sceptre for your event! A charter group will usually consist of members of the chartering company and their guests, who spend the time together in close company, having time to relax, bond and generally enjoy themselves. For many, it will be their first taste of sailing and many guests really take to the new experience. For a number of companies, chartering Sceptre has become an annual event to anticipate with relish. Sceptre fully complies with all the MCA requirements for a commercial charter craft, who require the boat to be constructed and maintained to comply with their Code of Practice, including independent annual inspection and a five yearly thorough survey. She is generally maintained by members of Sceptre Preservation Society and Friends of Sceptre, whose range of skills is remarkable. 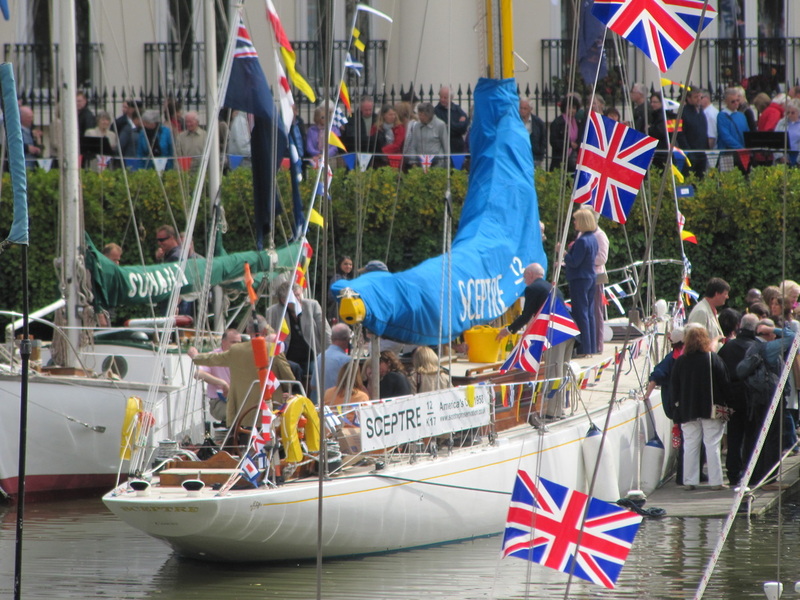 The income from charters is used by the Sceptre Preservation Society to further its aims of maintaining and improving Sceptre, for the benefit of all those interested in her history, and to keep her sailing safely in UK waters. What sort of group might charter Sceptre? 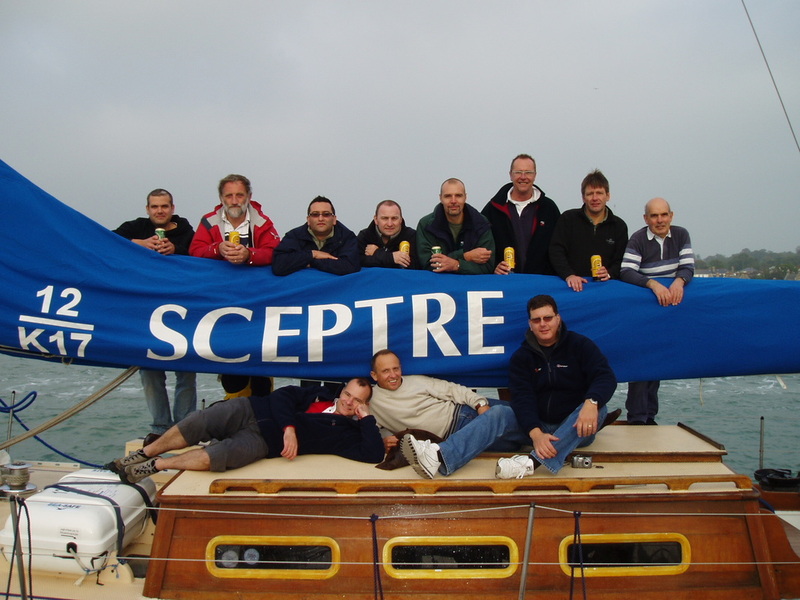 A group of up to 9 people might charter Sceptre to provide a corporate opportunity for teambuilding or entertainment, or to take part in an event such as the Round the Island Race or the Windsor Cup. 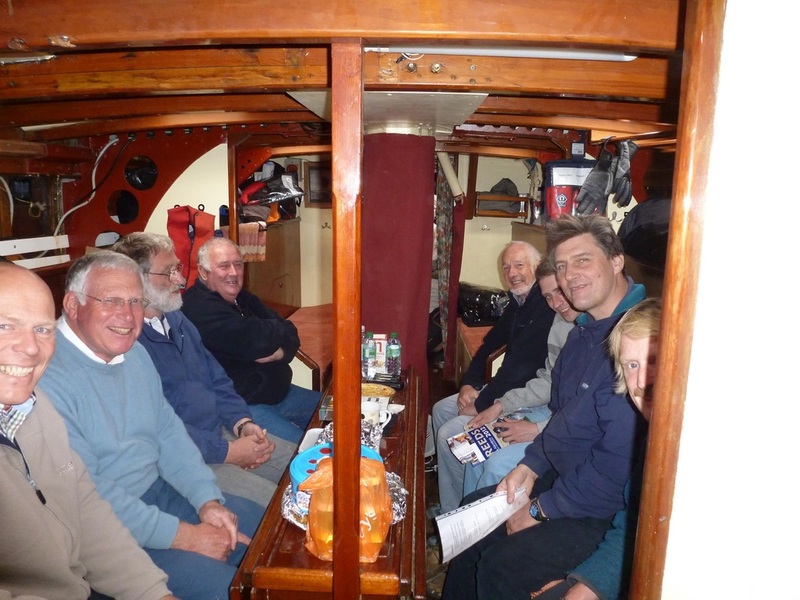 None of the group need have any previous sailing experience, but all will be encouraged to make the most of their time on Sceptre by taking a turn on the helm or helping to hoist the sails. 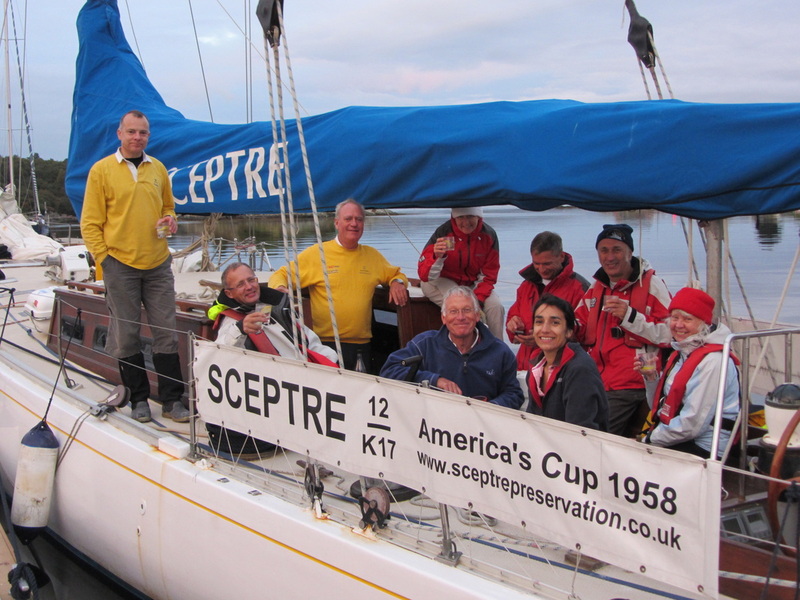 Sceptre has also hosted weekends for groups of younger people such as the National School Sailing Association. When is Sceptre available for Charter? In 2019, Sceptre is available for Charter for weekend trips (or longer by arrangement), on the Solent or the South West coast of England. She is also available for a number of prestigious events this year: the Falmouth Classics (14-16 June), the Round the Island Race (Saturday 29 June), and the British Classic Yacht Club's Classic Regatta (13-20 July). Weekend charters are usually Friday afternoon to Sunday afternoon, from April to September, dependant on availability, so please contact us for more information. Is Sceptre right for my group? Sailing on Sceptre is an exhilarating experience, and the skipper will make sure that all those who wish to be involved can help to sail this magnificent boat. She was however, built before such things as power-assisted winches were commonplace, so a certain amount of energetic manpower is required for sail handling! Sceptre sleeps 12, with the accommodation being in the central saloon area; those requiring a degree of privacy may find this arrangement rather challenging, but for those with community spirit and an enthusiasm for a sociable and exhilarating few days, it is unbeatable! "It was a brilliant weekend. Thanks so much for the opportunity". We offer weekend breaks and occasionally longer trips, for up to a maximum of 9 guests. 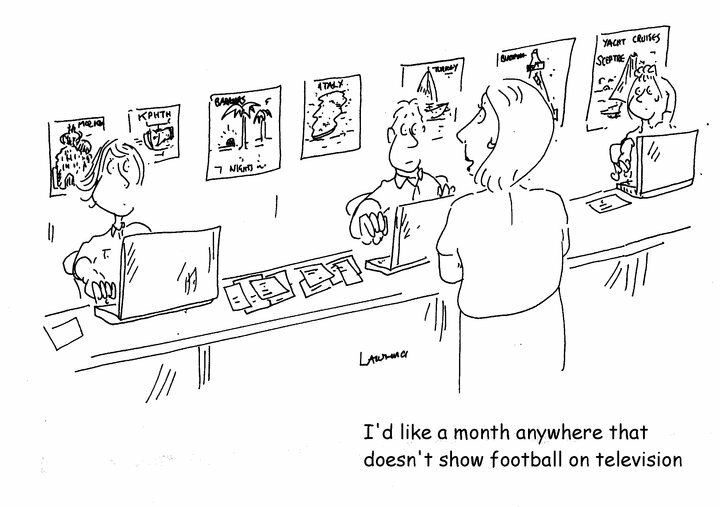 Please contact our Sailing Secretary to discuss your ideas, or send us your enquiry using the Charter Enquiry Form. Prices start at £4000 for the Fri-Sun weekend, but vary depending on the event, whether racing or cruising, and the length of the charter, so do contact us. Weather conditions can change quickly and we recommend that you bring clothes suitable for both hot /sunny weather and wet & windy weather. T-shirts, jumpers, shorts, long trou-sers and hats are all recommended to be in your kit bag. Better still bring lots of layers. Thermals or jogging bottoms under normal trousers can really make the difference if it is a cool day. You won’t enjoy the day if you are cold. We don't recommend jeans, as the seams can lead to chaffing and they take a long time to dry out if you get wet for any reason. We would recommend a lanyard/sunglasses strap for your glasses and/or sunglasses. If you have some sailing gloves, bring them. 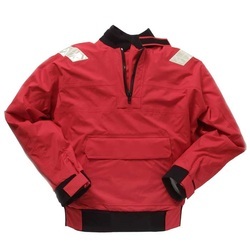 You should bring wet weather gear: a wind and waterproof jacket to go over several layers of clothing, and, if possible, waterproof trou-sers. Your kit should be carried in a soft bag. Please do not bring a suitcase - they aren't safe, won’t fit in the lockers and can cause damage to the boat. Please wear deck shoes, trainers or other soft-soled footwear. Your footwear should have good grip as you will be moving around the boat and the deck may get wet at times. Sensible footwear is essential for your own safety and for the protection of the boat. Office shoes are not safe on a yacht. The marinas we berth in have full shower and toilet facilities, but you'll need to bring your toiletries and a towel. Hand towels are provided for each of the heads (toilets) aboard. You should bring a sleeping bag and pillow. Earplugs are a very good idea, and there are plenty on board. If you are likely to need to recharge your phone or IPod, please bring a 12v lead (in-car charger). Depending on power source availa-ble, you may also be able to use a conventional lead. If you are concerned about sea sickness, we would recommend the antihistamine Stugeron, which is available from chemists. This should be taken as instructed on the pack, 2 hours be-fore sailing. A supply of Stugeron is also available on board. Sun cream of at least factor 25. For those with fair skin, skin conditions or who easily burn, we would suggest an even higher factor. Sunglasses - good quality sunglasses with 100% UV protection. Polarized lenses are very good at stopping the sun’s glare from the water.